He broke his other arm. His wrist to be exact. Do you remember last year when he broke the other? See here and here. Apparently I jinxed him with this post. Anyway...here he is in his temporary splint. The kid loves to climb. I try and try to dissuade him...but sometimes he forgets. So he climbed a book case and jumped off. Why you ask? Who rightly knows. At least it was only a small 3-foot book case, but it was still high enough to break his wrist. What will I ever do with him? He is one tough cookie though. I don't think the doctors believed me when I told them I thought it was broken. They poked and prodded him and he didn't make a peep. Unfortunately his tough streak makes diagnosing and trying to decide whether or not to go to Urgent Care a little difficult. But in the end, my "intuition" rang true...and I got to tell my husband "I told you so", which is always so fun! Poor little buddy had just learned to ride his bike sans training wheels the day before so it's been quite heart-breaking to explain over and over how he won't be able to ride again for a bit. Oh man! Bummer! He sure looks cute in the picture though. I was actually thinking of poor Dennis and his casts/broken arm(s) yesterday when you posted your heart shaped cactus pic. Lou, are you sure you aren't pulling another April Fool's joke?? 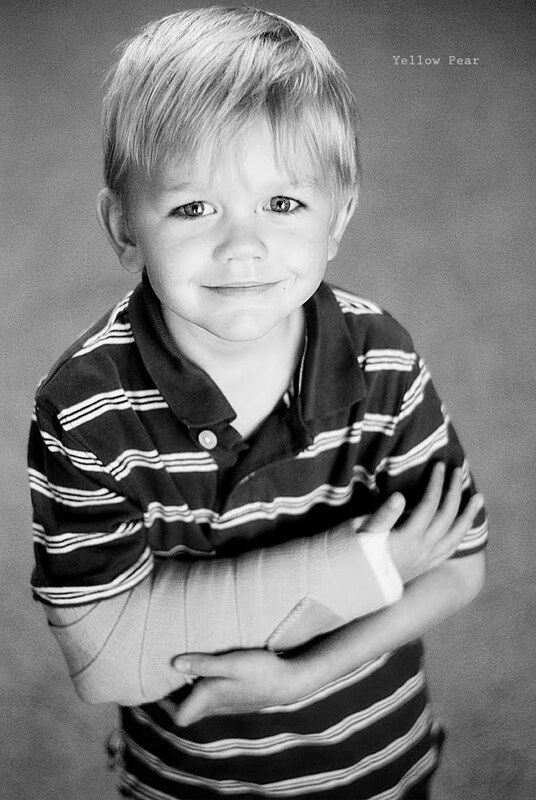 He looks quite pleased to have a cast :O) funny kid! Oh! Oh! Awwwwwwwwwwww. You wouldn't wish is on anyone - and I'm so sorry that these are bookending around a whole bunch of other chaos. Hopefully, with a splint, some time, and a few "I told you not to jump of that"'s, there will be some peace and quiet around your place. So this is what it's like having a boy? Oh dear! I hope he can adjust well to his infirmity. p.s. I love the heart cactus and all the cute things you did for Valentines. You're so Martha Stewart! Poor little guy. Did he have to have his wrist re-set? Hope he has a quick recovery. Now you need to post his orangeness. How come I didn't get to sign that beauty anyways? I will have to have a chat with him about that next time.